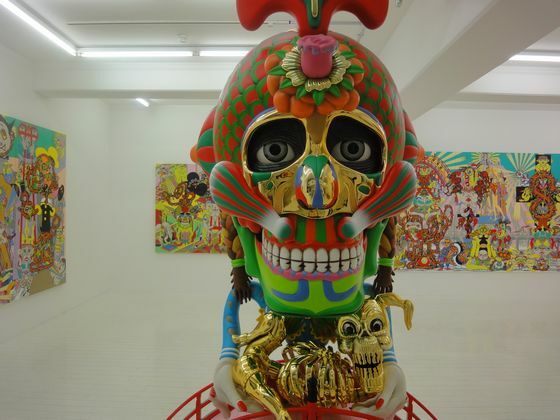 Sculpture by Keiichi Tanaami at NANZUKA UNDERGROUND, Shirokane, Tokyo. 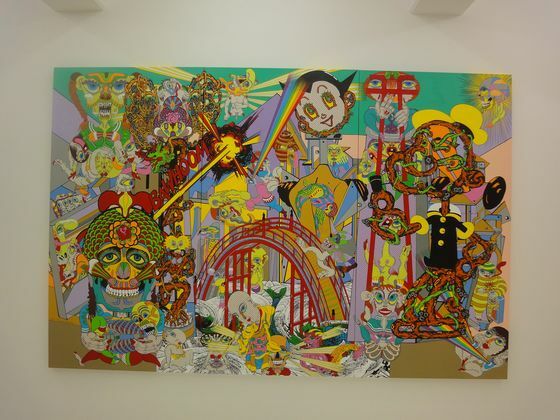 Exhibitions titled “Dividing Bridge” and “Lost and Wandering Bridge”, both by Keiichi Tanaami were held at gallery NANZUKA UNDERGROUND, Tokyo. 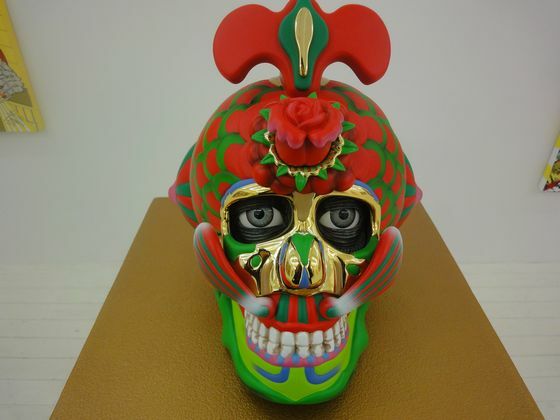 We would like to show you his powerful paintings with new vivid sculptures. When I entered the gallery, this large sculpture (image above) was facing straight toward me. A large skull with pig tails is holding another golden baby-like skeleton. And they are set on a red bridge. The “Bridge” was a theme of the exhibition. 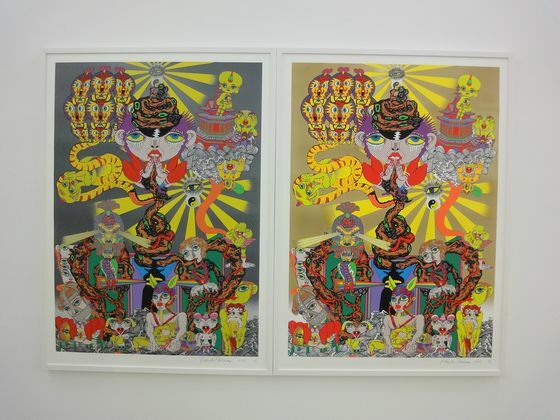 Painting by Keiichi Tanaami at NANZUKA UNDERGROUND, Shirokane, Tokyo. 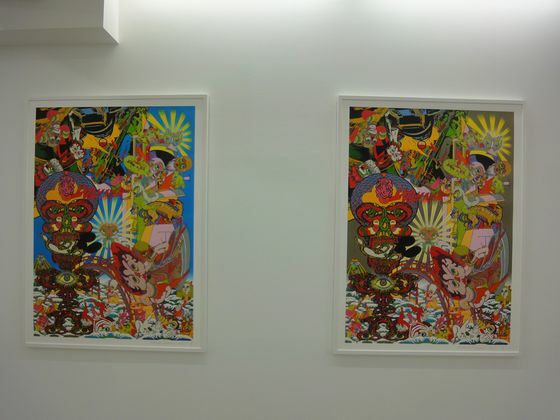 The Dividing Bridge exhibition is based particularly on Tanaami’s strong interest in the unique meaning of the bridge. Tanaami explains, “The bizarre and dramatic combination of the severed head and drum bridge I had seen in a movie as a child and the dead body and drum bridge I had seen during a nighttime air raid invites me to another world divided from this world by a bridge. Since his childhood, Tanaami has noticed the relationship between the bridge and death, and has done much research about the mystery of the bridge as the cross point bridging this world and the next. “A long time ago, it was commonly believed that under the bridge “there exists, at any rate, a different world”. The term “riverbed performer” is an example of how strong the ties were with the performing arts; that was where everything from street performances to kabuki took place. 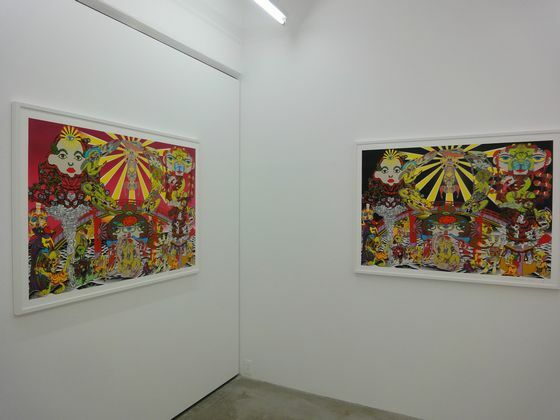 Exhibition view of “Dividing Bridge” at NANZUKA UNDERGROUND, Shirokane, Tokyo. The red bridge appears as a major motif in the main piece of the exhibition, Bridge to the Other World, a large-scale painting measuring 2x3m, as well as in his new sculptural works. These bridges always appear along with skull characters. Along with the red bridge in Bridge to the Other World, celebrated cartoon characters Atom and Popeye appear together with numerous deformed specters, monk ghosts, little girl ghosts and skeletons. In one sculpture, he recreates in model form a figure that appears in the painting, a skeletal girl carrying a golden, glowing baby in her arms as she crosses over a red bridge. 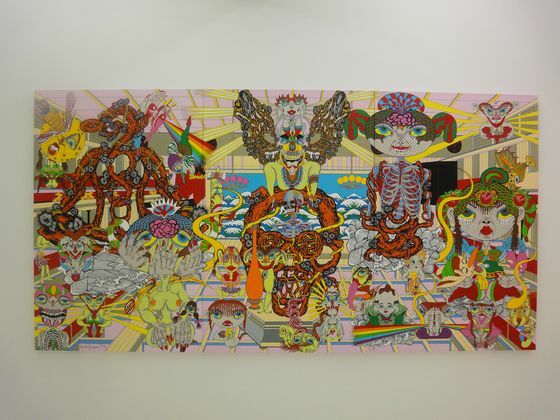 Tanaami says that his personality morphs dark past experiences into positive expressions, but the world drawn here is Tanaami’s ultimate paradise, transcending good and evil, affliction and fear. 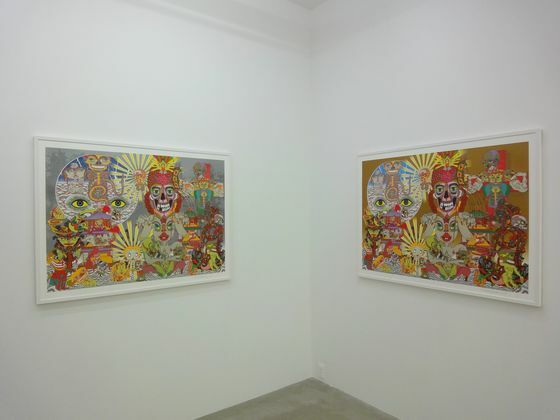 Exhibition view of “Lost and Wandering Bridge Series” at NANZUKA AGENDA, Shibuya, Tokyo. 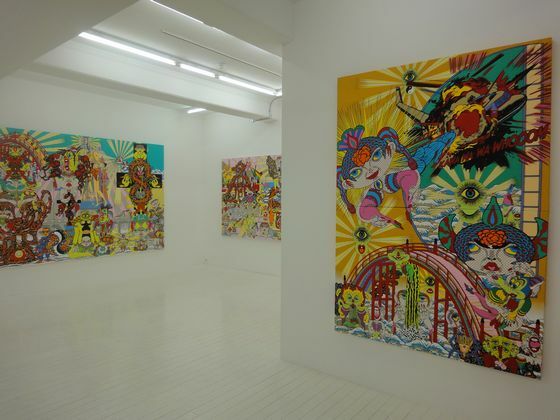 ?”Lost and Wandering Bridge Series” was held at the other space, NANZUKA AGENDA located in Shibuya. Tanaami’s new 11 prints were mainly exhibited here. 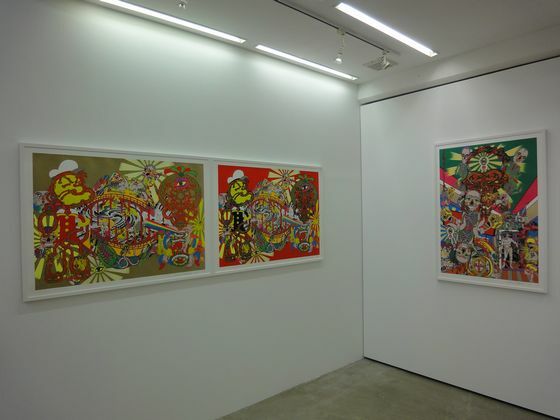 *NANZUKA UNDERGROUND placed in Shirokane will?close in Dec 2011 and moving back the main gallery to NANZUKA AGENDA in Shibuya. The gallery name will be simply NANZUKA.